This week there are Buddha’s birthday celebrations across Korea. The big day was yesterday, May 3rd. 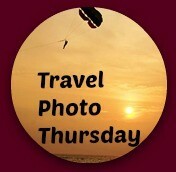 Welcome to week 326 (5/4/2017) of Travel Photo Thursday. I must admit that I stayed away from the festivities this year. However, over my years in Korea, I have attended many gatherings celebrating Buddha’s birthday. Here is a collection of some of my favorite photos taken over the years. Enjoy! I do read each and every one, and always try to respond. The colors and the smiles make this photo an all time favorite. 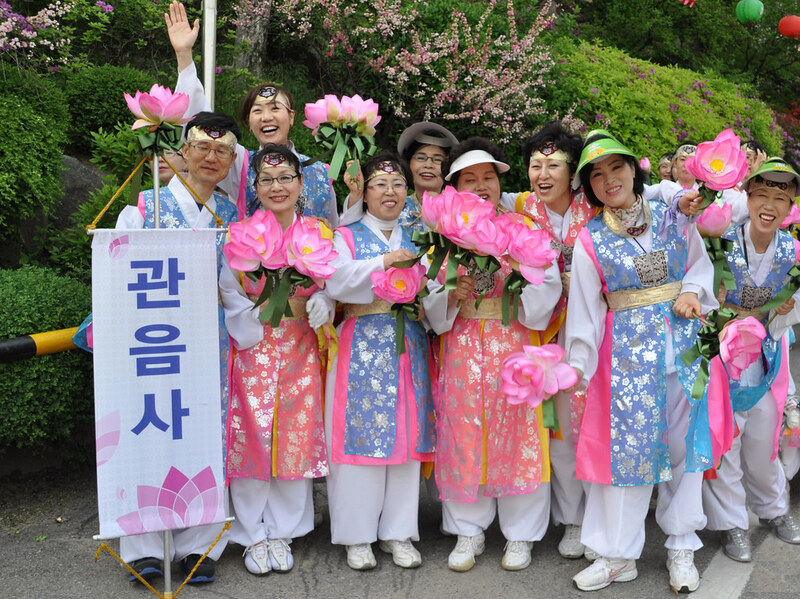 For the most part, Koreans usually aren’t the happiest, but something seems to happen during Buddha’s birthday celebrations, and the smiles are contagious. On the birthday eve, there is a huge birthday party held in the stadium of one of the local universities. While there is a lot of pomp and ceremony, it’s also a festive and fun event. More smiles, wearing their colorful birthday outfits. 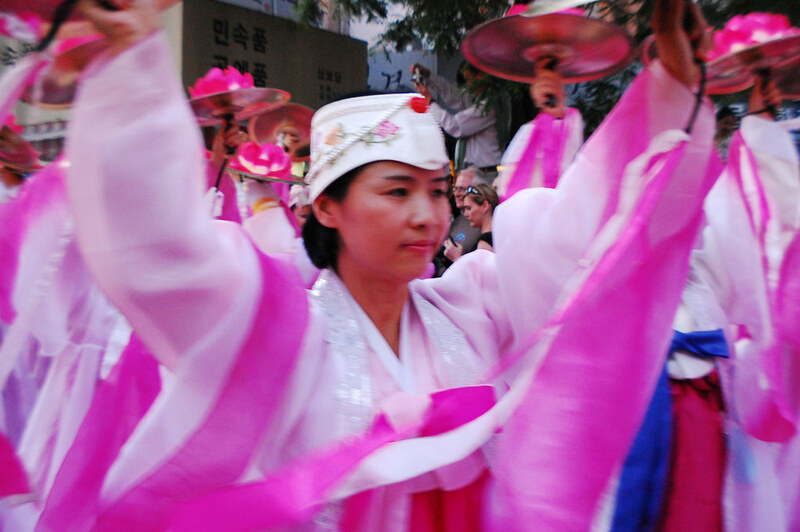 Many walk in the parade that winds itself through the streets of downtown Seoul. Gifts are also presented to the Buddha just outside Seoul’s main Buddhist temple, Jogyesa. 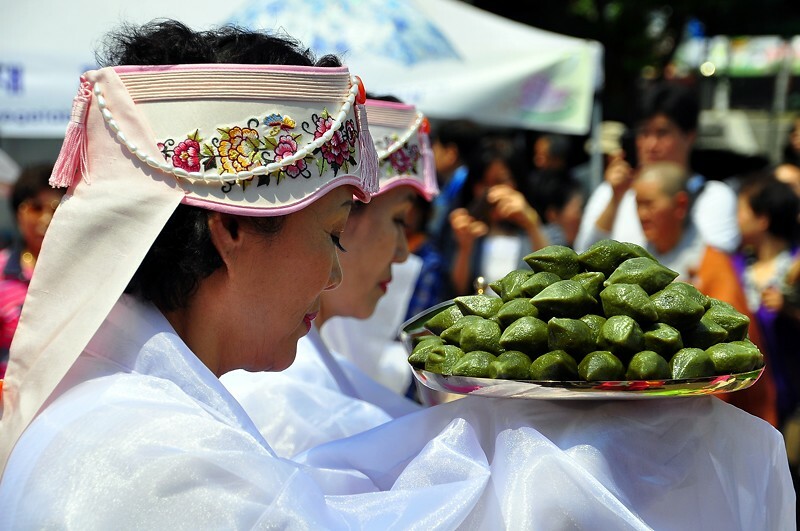 The worshippers are offering songpyeon, Korean rice cake. 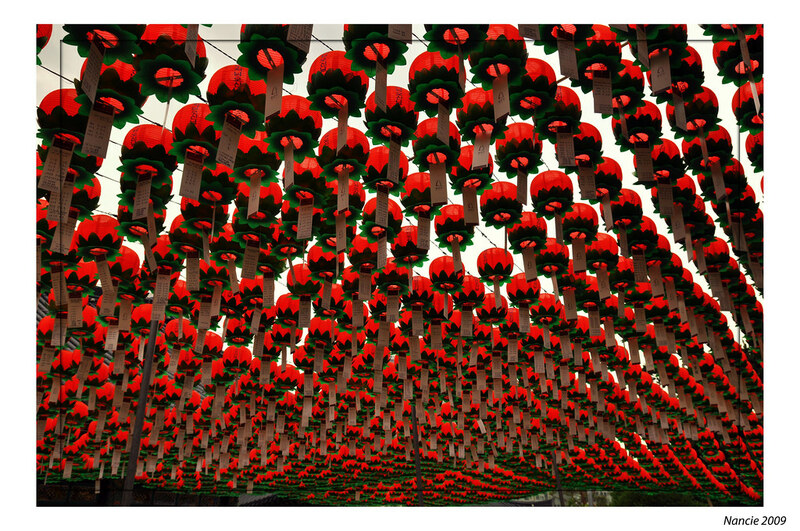 Four to six weeks before the big day colorful lanterns begin to pop everywhere across the country. 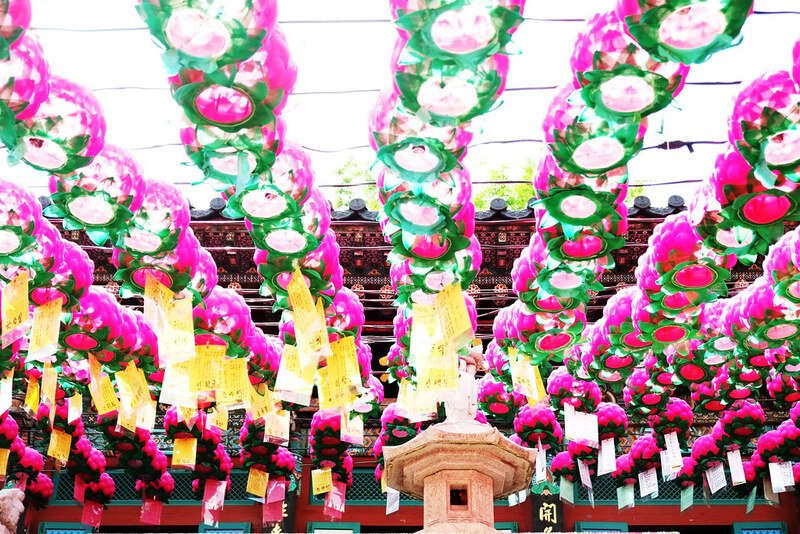 These graced the entrance of Jogyesa Temple. 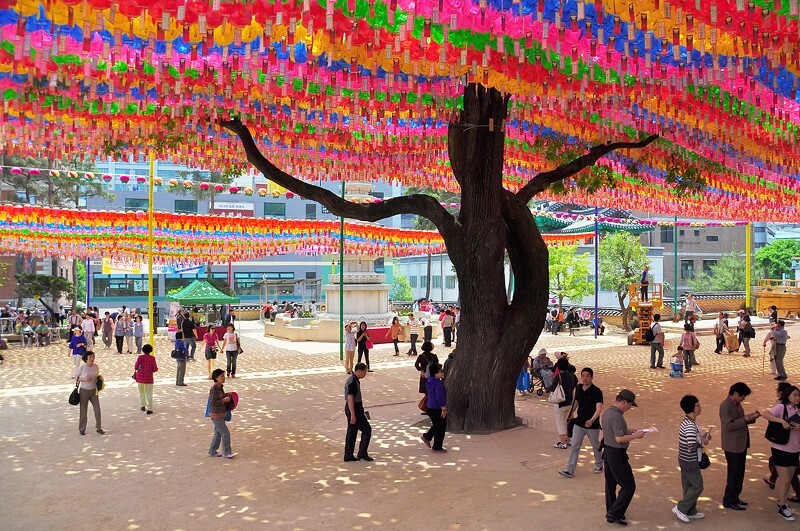 Buddha’s tree in the courtyard of Jogyesa Temple. 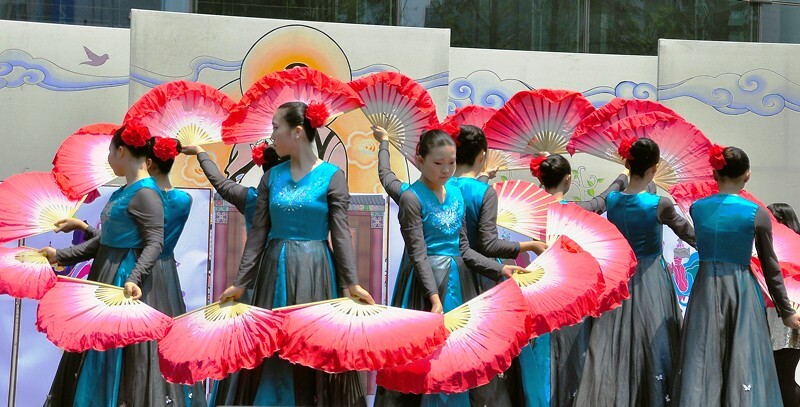 Traditional dancers are also part of Buddha’s birthday celebrations, and I never tire of watching the magically elegant fan dance. Forty-three percent of Koreans are Buddhists, so his birthday is without a doubt one of the biggest festivals of the year. Based on the lunar calendar, the date changes from year to year. In 2018 the holiday is May 22nd. Have you celebrated Buddha’s birthday in Korea or elsewhere? Let us know in the comments. I would never tire of this either!!!! Hi, Jackie! It’s one of those festivals that never gets old. I love the lit up lanterns in the first picture. Are there candles inside? Hi, Sabrina. I think there were candles inside. Wow! Simply wow! 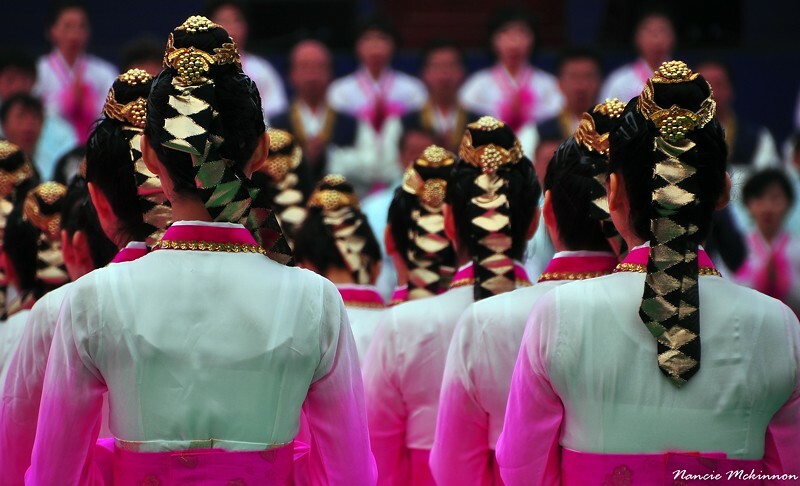 The vibrancy of the colors in these photos and the pageantry just grabs you. 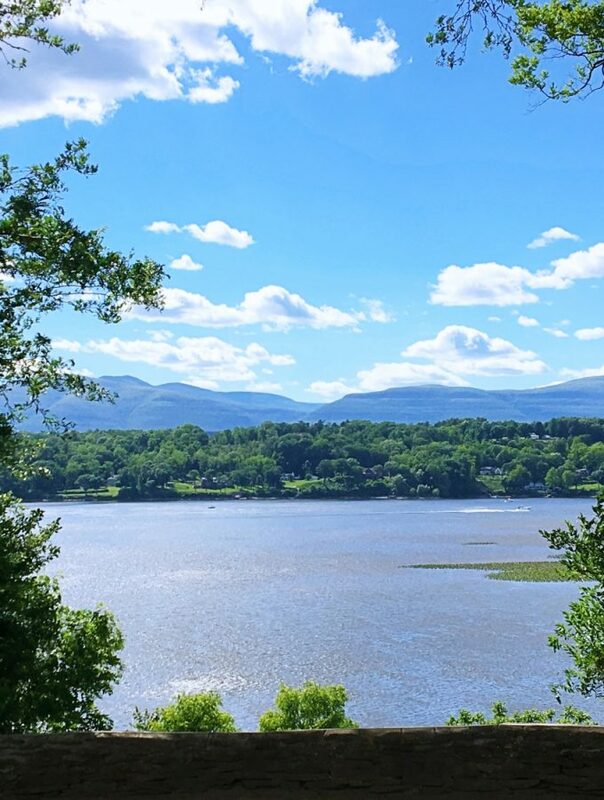 One of my favorite posts of yours Nancie, you’ve definitely caught the spirit of place in these! Hi, Jackie. Thanks for your kind words. I can never get enough of these colors. Wow! I love all the colors especially on that tree, the lanterns but I really love all their costumes. This just looks like a beautiful and fun celebration. Hi, Mary. It’s one of those celebrations where people seem to relax and get into the moment. Gorgeous photos, Nancy and I’d love to see some of these festivities, especially a fan dance. I can see why your first photo is a favorite of yours with the rainbow of colors and the beautiful smiles! Hi, Anita. The fan dance has always been my favorite. Hi, Ruth. I think there are a lot more Buddhists here than the stats show. 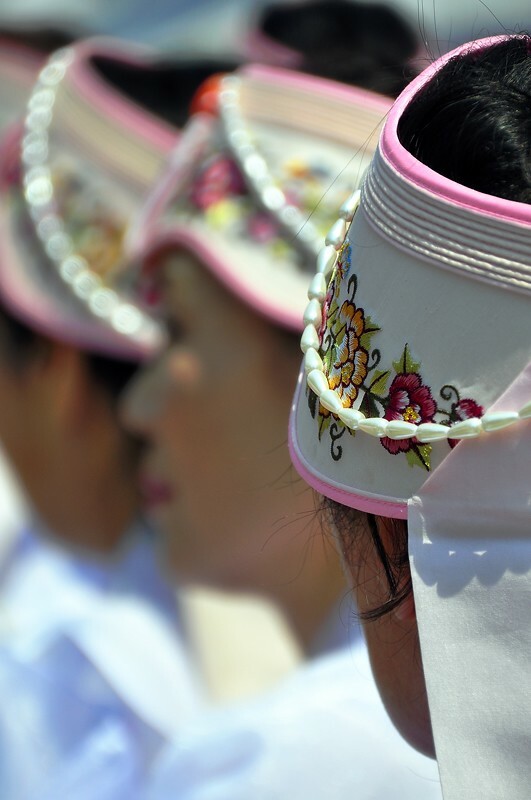 Many Korean Christians also practice Buddhism but don’t publically admit to being Buddhist. Religion here is complicated. I’m surprised that only 43% are Buddhist. What are the rest? 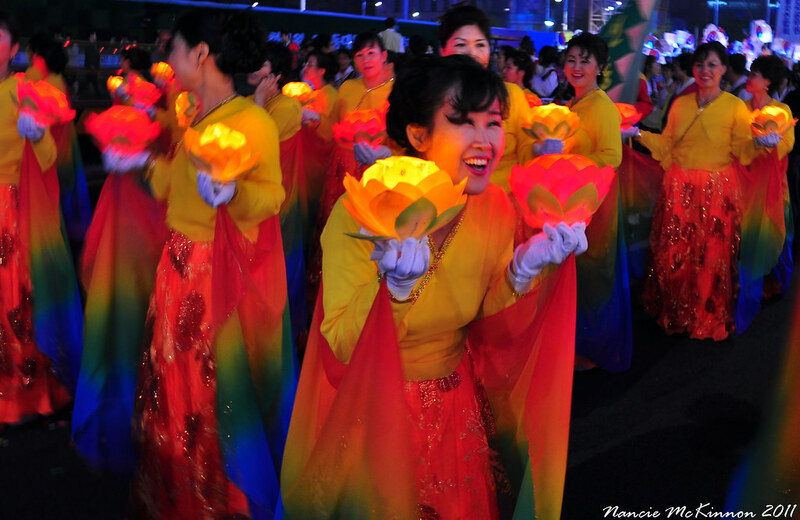 There are so many good photos here, especially the ones of all the colorful lanterns. It’s a much bigger celebration in Korea than it is in Malaysia, I think. Hi, Michele. Korea has a large Christian population. The missionaries have done a good job here. Many of those Christians are probably Buddhists, too. Religion is not black and white here. What gorgeous colors Nancy! Oh and great photos! Hi, Cacinda. Thank you! The colors you can catch during this festival are always amazing. What a beautiful and vibrant post. Great way to find out more about celebrating Buddha’s birthday – something I hadn’t come across before. Thanks! Hi, Catherine. Korea goes all out for Buddha’s birthday. It’s an excellent time to visit the country. We came across Celebrations on the river in Phnom Penh that were very colourful and crowded. We asked what it was about when we returned to our hotel and they said it was for Buddhas Birthday but when we googled it the dates were wrong. We were there in Oct/Nov and it was meant to be in May, so I’m not sure! 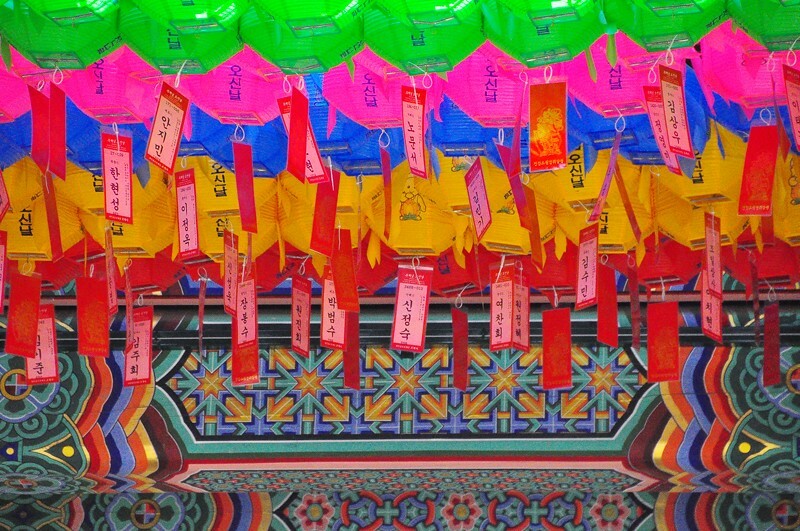 I love your photo of presenting rice gift to Buddha at Seoul’s main Buddhist temple, Jogyesa. Hi, Jan. I’ve discovered that Buddha’s birthday is celebrated on different dates throughout SEA. I know it’s based on the lunar calendar but makes no sense to me. In Thailand, they call it Macha Bucha (wrong spelling maybe), and it’s usually in January or February. Very confusing!